Stoke Hammond's MVAS is shared with other villages, managed by us and moved around the village to pre-agreed locations. 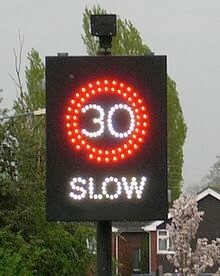 It is set to display the speed limit when approached by a speeding vehicle. It acts as an effective reminder to speeding drivers, encouraging safer driving and improving road safety. Our MVAS produces statistics which help us to keep the speeding problem under review. Statistics are available to download at the bottom of this page and are updated regularly. Volunteers in Stoke Hammond have also been trained to use hand-held speed camera devices. If you would like to help with this initiative to discourage speeding and encourage safer driving please let us know. December 2017 Leighton Road monitoring traffic entering Stoke Hammond from the Leighton Buzzard direction.